Springtime in Wichita is the perfect time to spread out your favorite red checkered blanket in the grass for a family picnic and enjoy the fresh air, flowers and sunshine. Wichita has more than 125 parks and greenways covering nearly 5,000 acres. These are our favorites for a picnic. Find flora and fauna native to Wichita at the Chisholm Creek Park. As one of Wichita’s largest parks, it has been designated a Wichita Wild Habitat area featuring a 1.6-mile nature trail along the Chisholm Creek, which includes a wetlands area. For your picnic, Chisholm Creek Park has an open shelter, picnic tables and charcoal grills as well as restroom facilities. After your meal, head over to the in-park Great Plains Nature Center to learn more about Wichita Wild Habitats and local plants and animals. O.J. Watson Park is an ideal location for your next family picnic, with more than 100 picnic tables and open shelters, a campfire circle and charcoal grills for rent. It also features fee-based activities to keep the entire family entertained in the outdoors for hours, including three children’s playgrounds, family fishing, miniature golf, a miniature train ride – a Wichita favorite! – pedal boats and pony rides. Nestled in Wichita’s scenic College Hill neighborhood, College Hill Park consists of a rolling landscape with large trees offering shade to picnickers. A children’s playground, multiuse court, tennis courts and a swimming pool make College Hill Park a great way to spend an afternoon in Wichita. Riverside Park is a must-picnic park with large open areas along the Arkansas River where you can enjoy the view of the river and surrounding ornamental trees. Explore the park’s central, north and south sections to experience all Riverside has to offer. The central section of the park houses the Kansas Wildlife Exhibit with animals native to Kansas, including beavers, red fox, hawks and more. Also in the central section of the park is Celebration Plaza, an interactive fountain popular during the heat of summer months. The north section of the park is where most people picnic on inviting lawns under beautiful trees. Remember to bring your racket if you’re heading to the south section of Riverside Park, which houses the Ralph Wulz Riverside Tennis Center. Another Wichita Wild Habitat – the largest in Wichita – Pawnee Prairie Park is home to deer, foxes, beaver and more than 100 species of bird. Open shelters and charcoal grills make picnicking in the wild flora possible, and one mile of paved and eight miles of unpaved trails offer scenic after-picnic exercise. Unique to Pawnee Prairie Park, is the Plumlee horseback riding trail perfect for exercising your horses, if you’ve brought them with you! 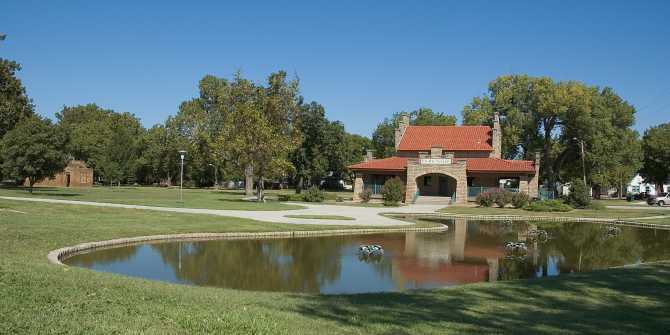 Sedgwick County Park is a popular Wichita picnic spot with open and enclosed shelters and barbeque grills for rent. Several lakes with fishing docks, volleyball and basketball courts, playgrounds and horseshoe pits fill out Sedgwick County Park for activities for the whole family. Key features of this large piece of land include the Boundless Playground, designed for children aged 2-5 for safe play, and a sledding hill perfect for winter fun – if not so perfect for picnics! Of course, not all Wichita parks require you to bring your own picnic basket. The ICT Urban Pop-Up Park in the middle of downtown Wichita features a variety of food trucks almost daily so all you have to do is bring your appetite.